A couple of years ago we blogged about the history of the L'Ortolan festive cocktail; a sparkling favourite during the festive season. We thought we would share this great blog with you all again and give you an update on all the flavours that have gone into making the 2012 festive cocktail so scrumptious. To sample the 2012 festive cocktail book a place on the L'Ortolan Festive Lunch. The sparkling wine cocktail with a specially blended syrup dates back to December 2005, and each year the syrup is developed by adding new flavours and spices. In 2011 a mulled wine reduction was infused with flavours of blackcurrant, strawberry, blueberry, fig, peach, pear, chestnut, herbs and spices & tot of Scotch. Using the syrup left over from last year as a base, L'Ortolan Sommelier Craig Steven has blended raspberry, blueberry and cream fruit liqueurs of blackcurrant, blackberry, peach and wild strawberry. Earlier in the a year syrup was made from the poaching liqueur from cooking Mirabelle's that were foraged from the local area for the use in some of the chef's dishes. The Mirabelle syrup has also been added to the blend for this year's festive syrup. During the run up to Christmas in 2005, the then L'Ortolan Head Chef Will Holland received a huge order of figs in order to prepare them for the December menu. The figs were to be poached and served with vanilla panacotta, so during November they were lightly cooked and placed in large preserving jars filled to the brim with a poaching liquor made with red wine, port, ginger, cinnamon, oranges and lemons, cloves, demerara sugar, star anise, vanilla, black peppercorns and bay leaves. At the end of the month, the figs were removed from the jars, ready to be prepared for portioning and service in December - and we were left with 30 litres of the most amazing tasting fluid in the jars. Luckily I had staked a claim on the liquid in advance, otherwise I'm sure that Will would have transformed the juice into a jelly or a sorbet. 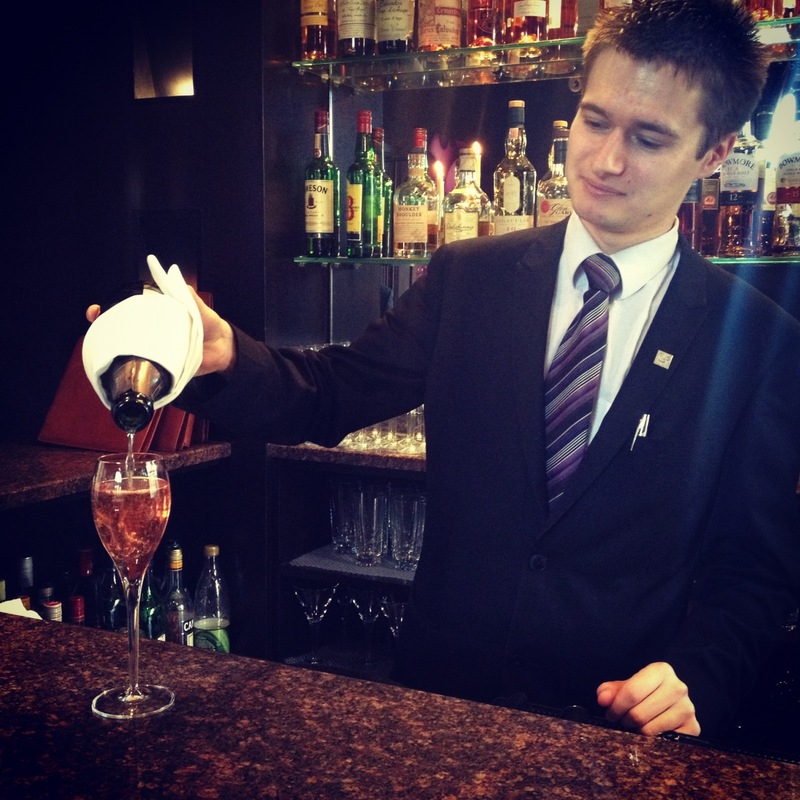 Initially I'd planned to use it neat as an ingredient for a mixed drink, but it was Will who suggested that we created a 'syrup' to add to sparkling wine - Kir Royale style! After several hours on a low heat we were left with a concentrated liquid, about a quarter of the original volume and packed with flavour. We filled mineral water bottles, and relabelled it "L'Ortolan Festive Cocktail" and our guests loved it and our batch sold out. Since then, each year we create a new syrup, especially for L'Ortolan guests. In the last few years, if we've had any syrup left over we use it as a base for the following year's - but the results are always amazingly different and the mixing of flavours is a real adventure. In 2007 we tried a citrus syrup made with various orange and lemon liqueurs, last year's was quite a spicy number as I found some fantastic ginger and mixed spice syrups that are the best quality - and this year will be more blackcurranty.